We are solving series of problems in Mechanical properties of Fluids.Viscosity is the property of the fluid due to which its relative motion is opposed. When a fluid is moving, it moves like different set of layers, each layer moving in the forward direction opposed the lower layers motion in the forward direction and thus viscous force is generated. It is directly proportional to the area of cross section of the fluid, velocity of the fluid flow and it is inversely proportional to the width of the layer. We can find coefficient of viscosity in this way. When a spherical body is moving in a fluid due to opposing viscous force and upward upthrust and weight in downward direction, some where the resultant force becomes zero and the body acquires a constant velocity called terminal velocity. A plate of area 100 square centimeter is placed on the upper surface of castor oil having only 2 mm thickness. Coefficient of thickness is given to us and we need to measure the horizontal force required to move the plate with a certain velocity and the problem is as shown in the diagram below. 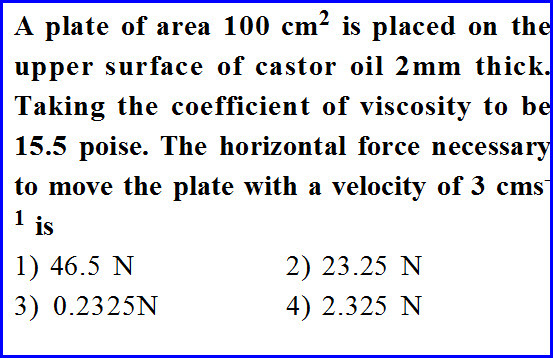 We can solve the problem using the very definition of coefficient of viscosity as shown in the diagram below. We know that the viscous force is directly proportional to the area of cross section,velocity of fluid flow and inversely proportional to the distance between the layers. 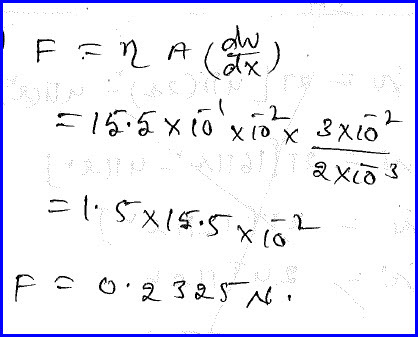 Solution is as shown in the diagram below. A vessel has a height of 40 meter. 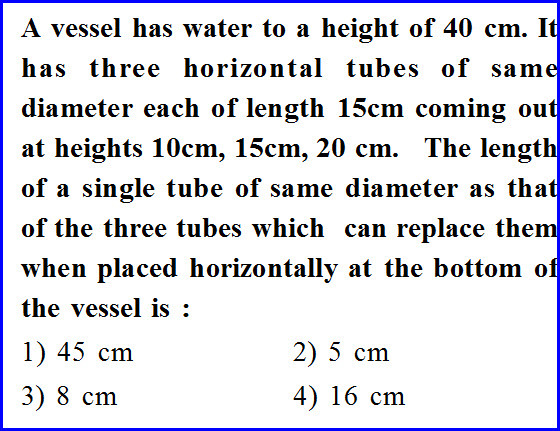 It has three horizontal tubes each of same diameter and length at different heights from the base as shown in the problem below. We need to find out the length of the single pipe of the same diameter that has to be replaced instead of three pipes so that fluid flow is same. The sum of rate of flow through each pipe has to be the fluid flow in the single pipe. We can use Poisellie’s equation and find the length of the new pipe as shown in the diagram below. A cylindrical tank has a hole of known area at the bottom. 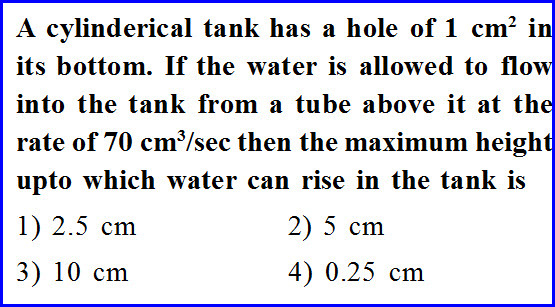 If the water is allowed to flow into the tank from a tube above it with a known rate, we need to find the maximum height of the fluid in the cylinder. Problem is as shown in the diagram below. At the maximum possible height of the liquid in the cylinder, the rate of fluid in is equal to the rate of the fluid out. 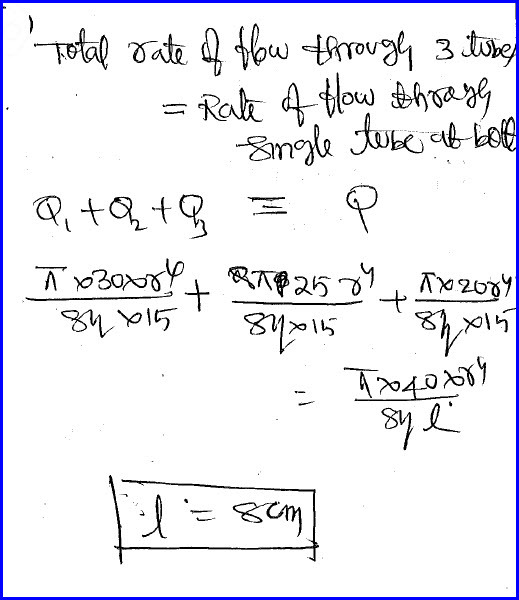 Rate of fluid out can be written in terms of equation of continuity and we also know that the velocity of the fluid coming out of the hole is similar to velocity of the freely falling body. Taking this into consideration, we can solve the problem as shown in the diagram below.